Welcome to All Sensors “Put the Pressure on Us” blog. This blog brings out pressure sensor aspects in a variety of applications inspired by headlines, consumer and industry requirements, market research, government activities and you. In this blog we’ll be discussing the pressure in bubbles. The surface tension of the interface between liquid and gas creates a pressure difference. For a soap bubble, the pressurized bubble of air is contained within a thin, elastic surface of liquid. When the bubble bursts, the difference in pressure causes an audible pop. 2γ/R is the Laplace pressure. The ΔP is 2 times the Laplace pressure since there is a complete sphere instead of a semi sphere on a layer of water. 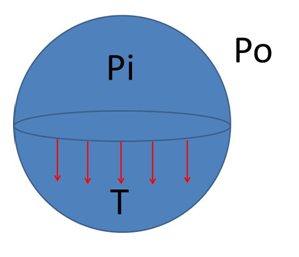 Based on the diameter, the pressure inside an air bubble in pure water, where γ = 72 mN/m at 25°C (298 K), can vary greatly. Welcome to All Sensors “Put the Pressure on Us” blog. This blog brings out pressure sensor aspects in a variety of applications inspired by headlines, consumer and industry requirements, market research, government activities and you. 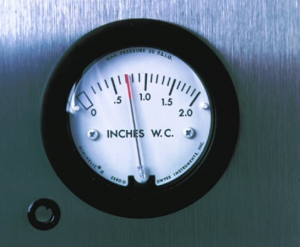 In this blog we’ll be discussing pressure in hospitals. Infectious diseases and chronically ill patients require special air handling equipment in hospital isolation rooms. The isolation could dictate either positive or negative pressure in the room. An isolation room at negative pressure has a lower pressure than that of adjacent areas. This keeps air from flowing out of the isolation room and into adjacent rooms or areas. In contrast, higher (positive) air pressure in the isolation room than in the adjacent corridor or anteroom prevents transmission from the outside environment to severely immunosuppressed patients. Historically, the transmission of tuberculosis has been a concern for many years. The Centers for Disease Control and Prevention (CDC) published and updated “Guidelines for Preventing the Transmission of Mycobacterium tuberculosis in Health-Care Settings, 2005” a little over a decade ago and identified the need for a negative pressure of at least 0 .001 inch of water to prevent spreading the disease. More recently, Avian Bird Flu H5N1, another highly contagious disease, has raised the need for isolation and negative pressure control. A pandemic disaster or chemical warfare could further increase the number of negative pressure isolation rooms/wards required in a community. Monitoring the room to outside differential pressure can be performed with manual techniques such as visually observing the direction of airflow using smoke tubes or with a pressure gauge. Both of these approaches require the person monitoring the room pressure to be at the room. With today’s lower pressure and cost-effective MEMS sensors, remote monitoring can easily be implemented so an expert (or experts) responsible for ensuring the positive pressure does not have to physically close to the patient’s room – and receives the warning of a problem in real-time.